The Summer 2014 edition of Heart Magazine, titled Helping the World, One Person at a Time is now available. Plus all of the information about upcoming special evens and regular event at Fulwood Free Methodist Church. You can read and download heart magazine below. We will also be delivering a copy to all of our neighbours. If you would like a printed copy and don’t normally get a copy delivered then call in at the church facility and we’d be happy to provide you with one. 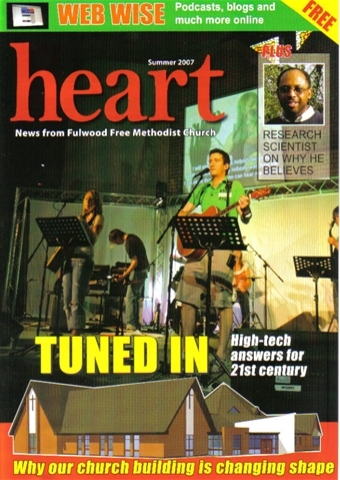 The Summer 2011 edition of Heart Magazine is now available online. So what do you think? I’m probably biased, but I think the 6th and latest issue of our magazine Heart is the best yet! A big thank you to my team who for the last 3 years have worked so hard to produce such a quality magazine. For those of you who weren’t aware, we produce 5500 copies of Heart 2-3 times a year, and people who are part of our church distribute around 5000 copies to their neighbours. The latest issue has the theme “21st Century Church”, because at Fulwood Free Methodist Church we believe that Jesus Christ is as relevant to the 21st Century as ever, and we want to show our community that as a church, we too are part of the 21st Century! But what I’d really like to know is what you think? Do you think Jesus Christ is relevant to today? Could he have something to say to you? Do you believe he ever existed? What do you think of church? Boring? Irrelevant? Untrue? All these are questions people regularly ask of us, and of God. But as many people are discovering, Christianity is certainly not boring! In a messy, mucky world looking for meaning, it’s certainly relevant. And as for untrue, we believe that there is enough historical, physical and scientific evidence to say that faith in Jesus Christ is not a blind leap of faith, but a reasonable step of faith. Please, post some comments to this here and tell me what you think! Ask me your questions! Or if you are local, why not come along to our next enquirers group, Christianity Explored, in a local pub/restaurant in the Autumn and explore for yourself! I hope you enjoy reading our magazine. If you have missed any of the back issues, you can find out more and how to request a copy at Heart Magazine.